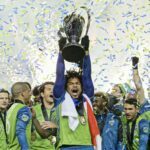 In the 108th minute of extra time in the MLS Cup we witnessed one of the best saves in the history of the league—certainly one of the most important—by the Seattle Sounders’ Stefan Frei. 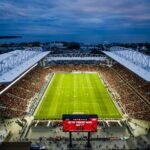 Tosaint Ricketts sent a chipped cross back towards the penalty spot for an onrushing Jozy Altidore, who leaped with all his might to send a looping header towards the top corner for a certain goal, only to be denied at the last second by a sprawling left paw from Frei to keep the game 0–0! For those of us who watched the game, and the drama unfold in real time, we thought this was a definite goal. Even the players involved in the play on the field did — watch Jozy’s reaction. He’s running away from the play ready to celebrate only to be crushed when the ball somehow doesn’t hit the back of the net. On most days this probably would have been a goal, but last night an obvious goal just wasn’t meant to be. 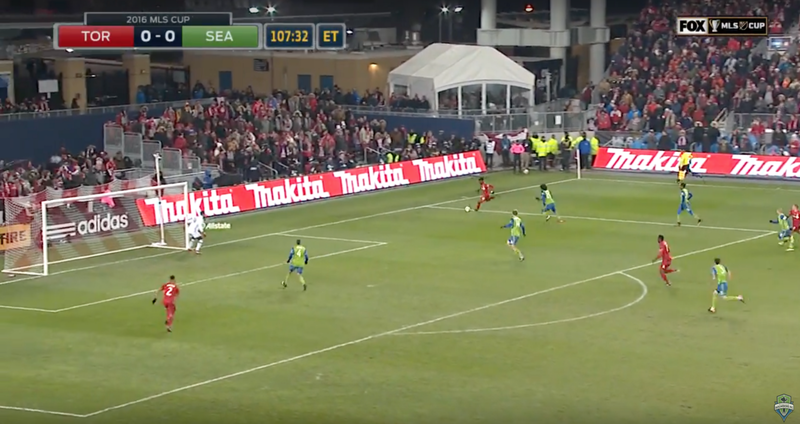 Anyone watching this save knew that it was spectacular, but how exactly did Frei manage to pull it off? Let’s break it down. 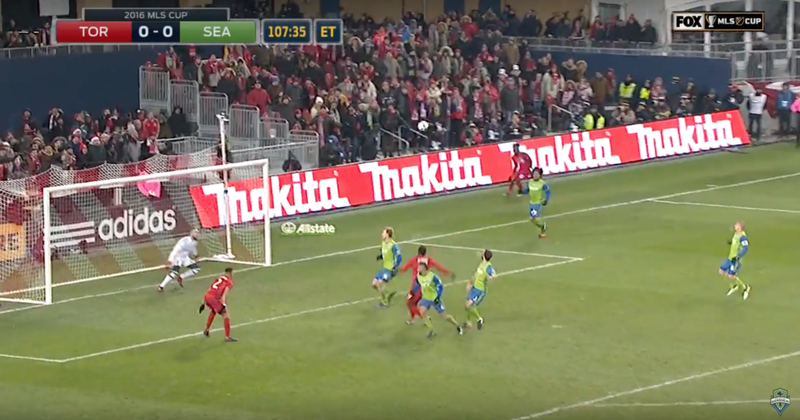 As Ricketts took the ball towards the end-line, Frei positioned himself at the near post in case Ricketts decided to shoot. 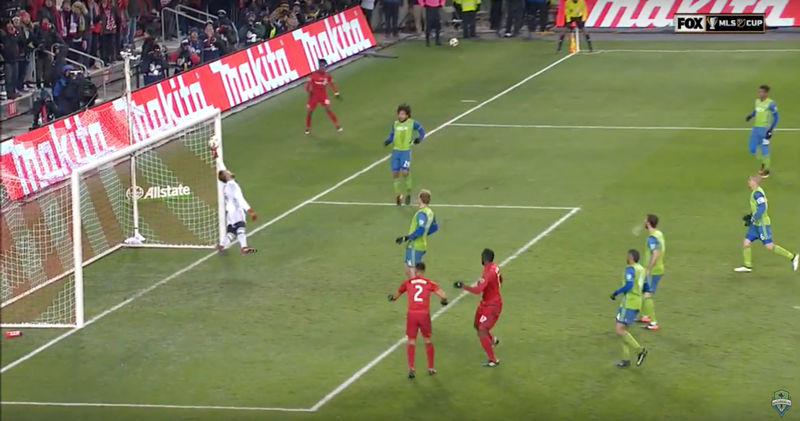 As Ricketts continued towards the end-line it became apparent that he wouldn’t shoot, because of his poor angle towards goal, and this signaled to Frei that a cross was coming — Ricketts decided to clip the ball back towards the penalty spot to an onrushing Altidore. 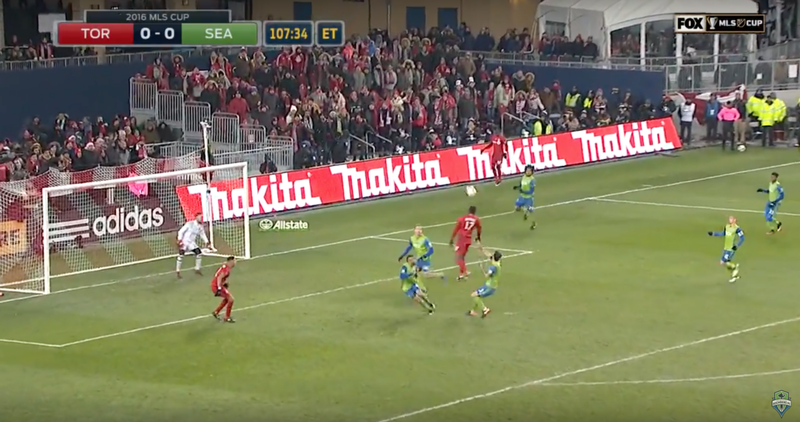 As the ball traveled in the air, Frei took a drop step, followed by a few small side shuffles to his right in sync with the flight of the ball. 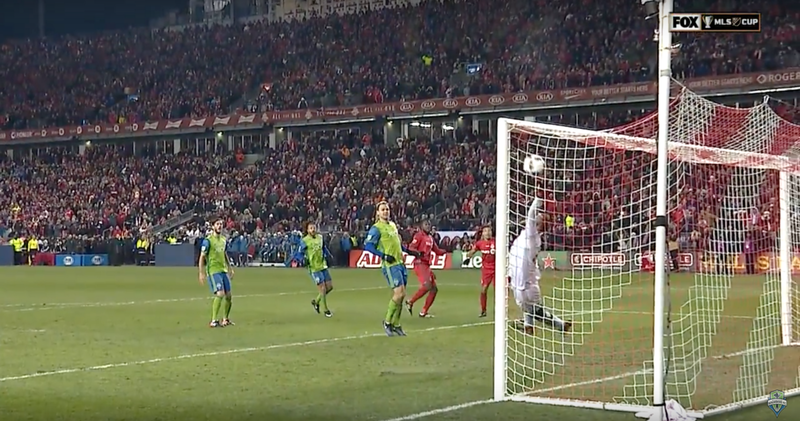 As the ball continued to float and get closer to Altidore, Frei made his steps even smaller. This allowed him to watch the play unfold and keep almost constant contact with the ground so he would be able to react and change direction as quickly as possible once the ball was directed on target. As Jozy rose to the ball, he did his best to get as much power on it as he could and send it goalward. It’s important to note how difficult this is for Jozy to pull off because the crossed ball didn’t have much pace on it, so it, in turn, made it difficult for him to generate his own power onto the ball. Here Jozy does an impressive job to send the ball towards the top corner. Just as Altidore got his head on the ball, Frei made sure he had full contact with the ground, and got himself set. This allowed Frei to quickly change direction and head in the opposite direction that his momentum was pulling him. If his steps are too big, if he isn’t set, or if his weight is unevenly distributed to his right side, he won’t be able to change direction as quickly and make the save. As the ball headed towards the top corner, Frei took one quick crossover step to his left followed by a quick shuffle step and leapt towards the top corner. 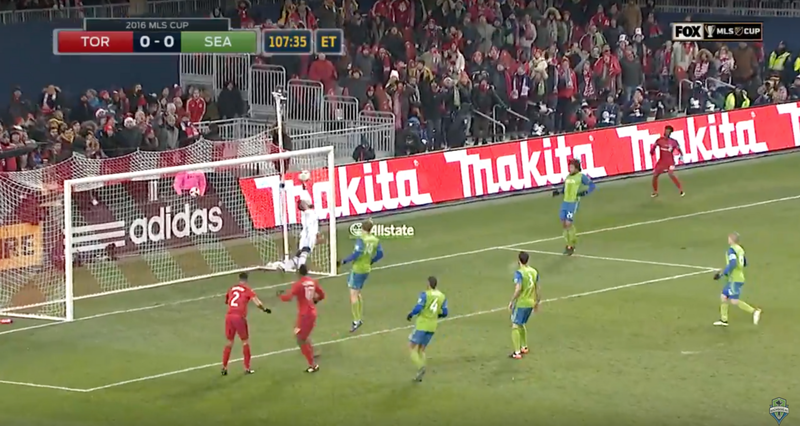 As Frei is midair he extended his left hand skyward and palmed the ball away from the goal. Notice where his arm is when he makes this save, it’s behind his body! If Frei decided to go with his top hand chances are the ball floats over his dive and into the goal. The timing of his jump is what makes the save, in addition to him leading with his left arm. If he jumps a split second earlier or later this ball ends up in the goal because he won’t have the correct angle or enough power to make the save. The ironic thing about this save is, as goalkeepers, we are taught to lead with the top hand with any shot over waist height. The theory behind this is that with the shots above waist height you get that extra stretch to make the save by leading with the top hand — and every extra millimeter covered makes the difference. However in this situation, with this type of shot, that rule doesn’t apply. The ball is floating on a looping trajectory in this instance, and Frei needed to generate as much power and strength to keep the ball out of the goal. If he lead with the top hand here, one of two things happens: 1) The ball would either loop over his hand and into the net, or 2) if he does manage to get his fingertips on the ball he probably won’t generate enough power to push the ball to safety. By extending with his left hand he gave himself the best chance to time the save, in addition to allowing himself the power to palm the ball away from the goal and to safety. Saves are a lot like goals in that the implications, or the stage of them, determine their greatness. If this save is made in a regular season game, or a game when Seattle is losing by multiple goals, we appreciate its difficulty but it doesn’t become etched in history. The fact that this save was made in a 0–0 game, with the MLS Cup on the line, makes this save that much more special and memorable. Without this save, Seattle go home the losers, but because of this save they lift the trophy. We’ve all heard that sports can be a game of inches and in this moment it couldn’t have been more true.